Here at MyMac.com you can be sure you’ll get solid information and insight on the usefulness and quality of all sorts of items for your Apple gear. When it comes to carrying your 13” MacBook Pro/MacBook Air there are only 4,000,000 or 5,000,000 bags out there to choose from. Instead of spending hours of time searching through a dizzying array of websites looking for that perfect bag, read about the hours we spent searching for that perfect bag so you don’t have to. Today I want to tell you about the blazer from STM. 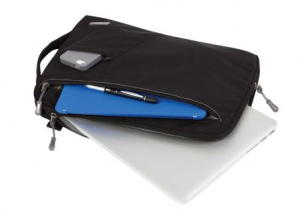 The blazer is advertised as a laptop sleeve for either a 13” Macbook Pro or a 13” Macbook Air, but it is more than just a sleeve. The exterior is made from “Velocity Polyester “ which sounds cool, but all that really means is the brand of polyester they are using is from a company named “Velocity.” The interior is a water resistant polyester which is very well padded with high density foam, and is softer than the exterior, which encloses your Macbook Pro/Air in comfort. I think both inside and outside will hold up very well for day to day use. The outside zippers have pulls that makes it easy to zip things up. There is a front pocket that accommodates a power cord and/or a cable or two. There is a pocket in the front to slip your iPhone in which I found very handy, however, it is not secure, so beware. My iPhone 4S with a Mophie Juice-pack fit snuggly in the soft pocket with about 1/2” of iPhone showing out of the top. There is a flap you can pull over the top but it was tight with my Juice pack installed. The same iPhone with no case slips into the pocket and can’t be seen but since most of us use cases this may not work for everyone. There is also no way to secure the pocket. I am guessing the the taller iPhone 5 will stick out of the top if it is in a case but this writer did not have one to try. There is stitching around the pocket and with the material used I don’t think it will stretch over time. The back of the blazer has a slip pocket. 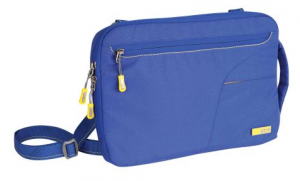 I like to carry file folders and this slip pocket accommodates them easily. The blazer comes with a removable shoulder strap but can be carried like a briefcase by using the briefcase handle on the end of the unit. This handle is a nice feature for that quick trip. I tried using the blazer with both a full sized 13” MacBook Pro and a 13” MacBook Air. The MacBook Pro definitely fills the bag and makes everything feel snug, while the MacBook Air leaves more room in the front zippered pocket for other stuff like your car keys. I like this bag. 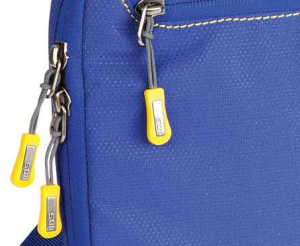 The zipper pulls are a nice touch. The blazer is small enough to slip into another case when traveling but functional enough to carry alone for a quick trip. The only thing I can fault it on is the size as it relates to a 13” MacBook Pro. 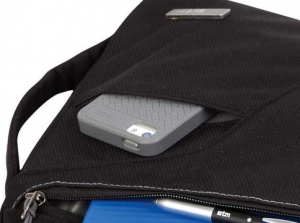 A full sized MacBook Pro makes the sleeve feel tight when you add items to the various pockets. If you really don’t plan on carrying much else, meaning a MacBook Pro, and a cable or two, plus iPhone, this bag is very good. 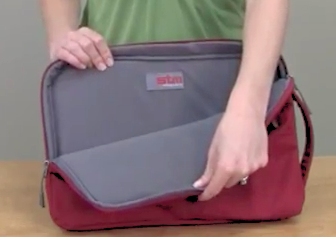 A 13” MacBook Air is perfect for this bag. The STM blazer comes in four delicious colors.